We are excited to announce the release of major GRAFT network update version 1.1.0 ‘Beta Lyrae’ to the master / mainnet! Multiple tests are passed, and all the seed nodes are updated. The major network update itself is scheduled for block height 67850, about a week from now on April 17th. Each GRAFT network node must be updated to the new software version before that block/date, otherwise, the node that wasn’t updated is going to be on the wrong version of the blockchain. This release contains the ASIC-resistance changes in the hashing algorithm and enhanced difficulty adjustment algorithm, which are supposed to protect GRAFT blockchain from most hashing attacks and stabilize the block intervals. As another reminder, major network update means that if you are running the GRAFT network node (graftnoded daemon), you must upgrade it to the current software release between now and April 17th. If you do not install the updated node before April 17th, it will be disconnected from the mainnet after block 67850. 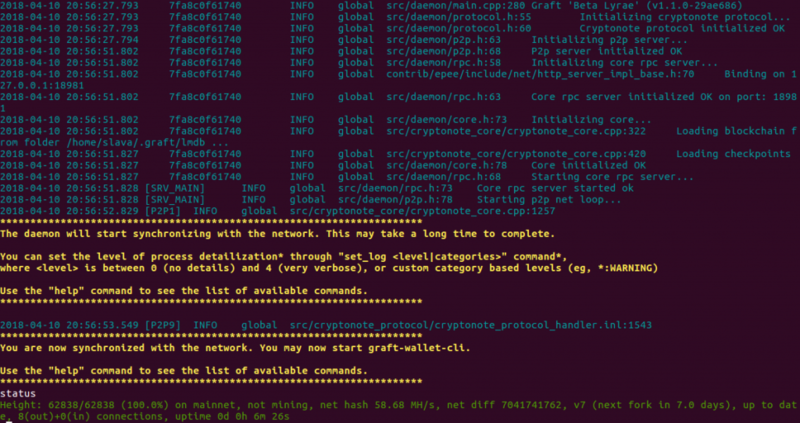 In order to check whether you are running the right version of GRAFT software, launch graftnoded daemon in terminal window (in interactive mode) and type help command. If you are running the right version you should see Graft ‘Beta Lyrae’ (v1.1.0-29ae686) in the first line of the help result. Note that the users of mobile and desktop GRAFT wallets apps are not affected by the upcoming network update and don’t need to do anything – as long as they are still connected to the default proxy supernodes (if you are connected to your own supernode, however, do not forget to upgrade the underlying network node). And finally, we would like to thank everyone from GRAFT community who contributed to the first major GRAFT network update by providing their feedback! We appreciate your support! We look forward to working together on our next major milestone – alpha and beta releases of RTA (real-time authorization) functionality of full supernodes. Stay tuned!